Whether you’re throwing a wine party or going out to eat with friends, expect appetizers and tapas to almost certainly be on the menu. Be sure to order the right drink to maximize the flavors of every bite. Not sure when white or red is best? Use this guide on appetizer and wine pairings to help you out. Mushrooms, truffles, onions, peanuts and popcorn are examples of earthy dishes. These flavors pair well with any red wine, especially Pinot Noir or Dolcetto, which are light-bodied but also feature savory depth. Salmon, shrimp, oysters, scallions, crab and other rich seafood in buttery or savory sauces taste delightful with white wine, such as Chardonnay. It’s the perfect pairing because a light, silky drink won’t weigh you down or compete with the flavors of your seafood dish. Tilapia, fish tacos and other lighter fish fare take on more flavor when paired with delicate white wine, including Pinot Grigio, Arneis or Chablis. Charcuterie, pretzel buns and other salted dishes pair exquisitely with Champagne and other dry sparkling wines. Their faint sweetness is what makes them especially refreshing when served with salty appetizers. 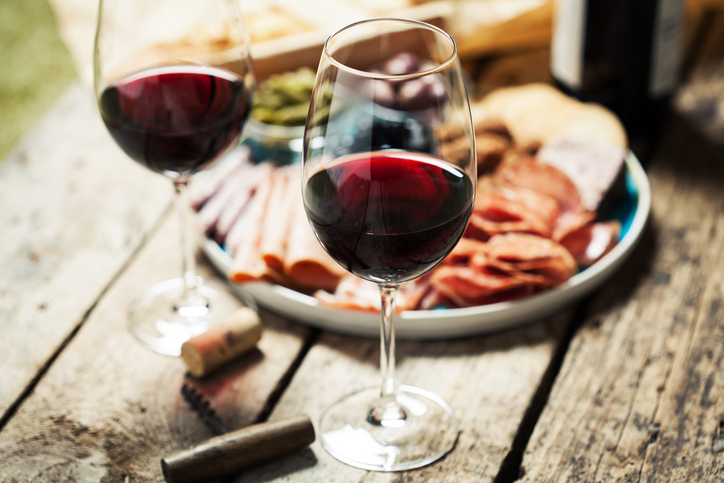 Beef, pork chops and sliders are examples of red meat that blend wonderfully with Cabernet Sauvignon, as well as Bordeaux and Bordeaux-style wines. The high concentration of tannins in these drinks refreshes your palate so you can savor each bite with renewed delight. Arugula and pear salad, candied bacon, and apricot chicken wings have captivating, tangy flavors that can overpower some types of wine. That’s why a zippy wine like Sauvignon Blanc is the perfect pairing. Some cheeses pair with red while others go better with white. Yet any indulgent cheesy dish such as fondue, grilled cheese and quesadillas are sure to taste delectable with dry rosé, making it a safe bet in almost any situation. Asian and Indian appetizers with sweet and spicy peanut, garlic and crushed red pepper sauces are tamed by the slight sweetness of Riesling. This helps you enjoy every bite without the spicy undertones overwhelming your palate. Vinum Bar is the perfect place to try out these great appetizer and wine pairings. Our tapas menu ranges from delicate Maple Glazed Peanuts to rich Crab Quesadillas to tangy Lemongrass & Garlic Wings. We also offer an extensive wine list to pair with these tasty tapas. Try out Vinum Bar tonight, or call us at 510-285-3585 to make a reservation for your party.